If you want to get to know who Ryan Reynolds is as an actor, you will have to dig a little deeper past his title role in VAN WILDER, even though it made him an underground goofball god.And you will have to go deeper still past his turn opposite Sandra Bullock in THE PROPOSAL, a role that catapulted him to international stardom and the top of every housewife’s “Celebrities they can cheat with” list.You have to dig deep but you needn’t look any further because Reynolds career-changing performance in Rodrigo Cortes’s BURIED, will show everyone what was behind that killer guy-next-door smile the entire time. 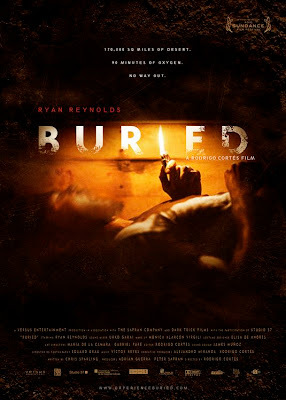 In BURIED, Reynolds plays Paul Conroy.The only thing we know about Paul when we meet him is that he is trapped in a wooden box, buried alive somewhere in Iraq.For the next ninety-five minutes or so, we learn that he is an American contractor working in Iraq, that he loves his wife deeply and that it is just as infuriating to navigate through automated voice systems when you’re buried alive as when you’re standing in your kitchen.And while that might be a slight exaggeration, Paul’s situation is not.He is being held hostage by a terrorist group looking for money that Paul just doesn’t have.He is running out of air and the only tools he has at his disposal are a cell phone and a Zippo lighter.If it sounds terrifying, it’s because it is. If you want to get to know Reynolds as a person though, you don’t actually have to dig very deep at all.He is about as genuine as they come, or at least that’s how he came off to me.When he entered the hotel room where our roundtable interview was to be held, he was introduced, one by one, to the handful of other journalists.I stood and admired his unassuming stance, his dressed down look and what seemed like actual interest in meeting the people he was shaking hands with.When he was introduced to me last, he took my hand, shook it firmly and said, “Hi Joseph. I’m Ryan,” while looking me directly in the eye, as if I wouldn’t know the name of the man who adorns the majority of the magazines on my coffee table.Fortunately, I did not swoon and pass out on the spot. BURIED marks a drastic departure for Reynolds.Not only is it a far cry from his more accessible fare, but he also has to carry the entire project on his own shoulders as the camera never leaves him.Reynolds has headlined before but never to this extent, so how did he know he could do it?A vote of confidence from the man behind the lens certainly helped. 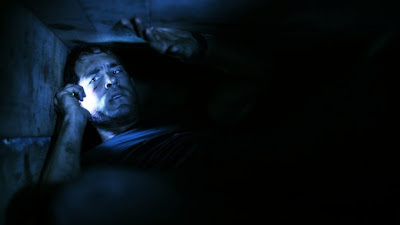 It may sound poetic but Reynolds was not convinced at first.“I did say no at first but only because it was impossible.”He says this as if he has forgotten that he and Cortes found a way to make the impossible very possible.“The movie had an incredible narrative challenge with the one actor and then an incredible technical challenge.”Cortes had some tricks up his sleeve though and after forty minutes of chatting up his inventive shooting plans for the film, Reynolds was in. Before long Reynolds was in Barcelona for a 17-day shoot that would prove to be much more difficult than he ever expected.“I lost a lot of weight,” Reynolds jokes. “It’s a great diet, coffins.” He had trouble sleeping; he had trouble eating.He even developed a bit of a bald spot on the back his head by the time it was all done. “Wood and sand are tremendous exfoliants.” Fortunately, the box didn’t kill his sense of humour. 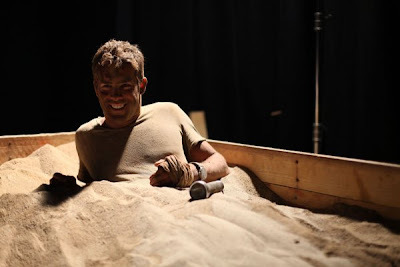 Reynolds insisted on not having any rehearsal time before the shoot.“I wanted to have all those moments that you see on film be firsts – the first moments he wakes up in there, the first sounds that come out of him.”The approach paid off.The first moments of BURIED are extremely jarring, not only because they are horrifying but because we are not used to seeing such a likable face in such a dire and confined situation.The tight framing and Reynolds’s very real reactions make you feel like you’re right there, trapped in the box with him.That said, I can think of worse people to be buried alive with. Reynolds swears he will never complain about his job again after BURIED.And while it may have been rough, he could not be happier with the way it turned out. One other thing is clear too.When Reynolds emerges from BURIED’s coffin, he too will be bigger because of it. For the BURIED Black Sheep review, click the title of the film anywhere in this interview. BURIED is playing nationwide right now.